Your guide to superior outdoor living! This story isn’t all that uncommon, unfortunately, many people think that concrete cracks because it is old – that is not the case at all. Concrete cracks because it is a solid mass and it is unable to flex when the earth moves. In order to comply with the movement of the earth, concrete will develop stress fractures. Much to the home owners’ dismay, their newly poured driveway can very quickly develop stress fractures. This is one of the reasons that pavers are not only popular but a better investment than concrete. Because pavers are individually placed and held in place by a special type of sand, the pavers are allowed to flex. Because of this flexing ability, they do not develop stress fractures. 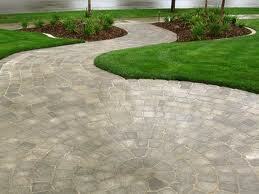 Pavers walkways or driveways can last for decades because of how durable pavers are. 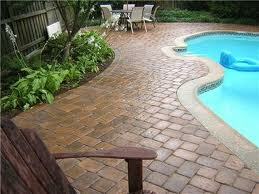 In addition to not cracking, pavers are naturally slip resistant. Pavers have a naturally abrasive texture which makes them a great solution for any area that can get wet – primarily pool areas. Pavers are also very durable in that they can withstand a high amount of pressure; this makes them a great material to use in commercial areas. If you are thinking that pavers sound just a little too good to be true, then give us a call and we will answer any questions that you may have. As you can probably tell, we are a big fan of pavers!